The complete responsibility for caring for the 104 orphanaged and abandoned children in the Somowathi Home is in hands of the local staff. The Somowathi Trust has the supervision in the childrens village. Alltogether 65 full-time and part-time emplyees work in our childrens village. They all receive a salary and have comprehensive sickness insurance. The project is nowadays completely managed by the local staff and receives a small financial yearly contribution per inhome child from the Sri Lankan government. To cover all operational costs the childrens home depends on The Sri Lanka Orphanage Foundation. 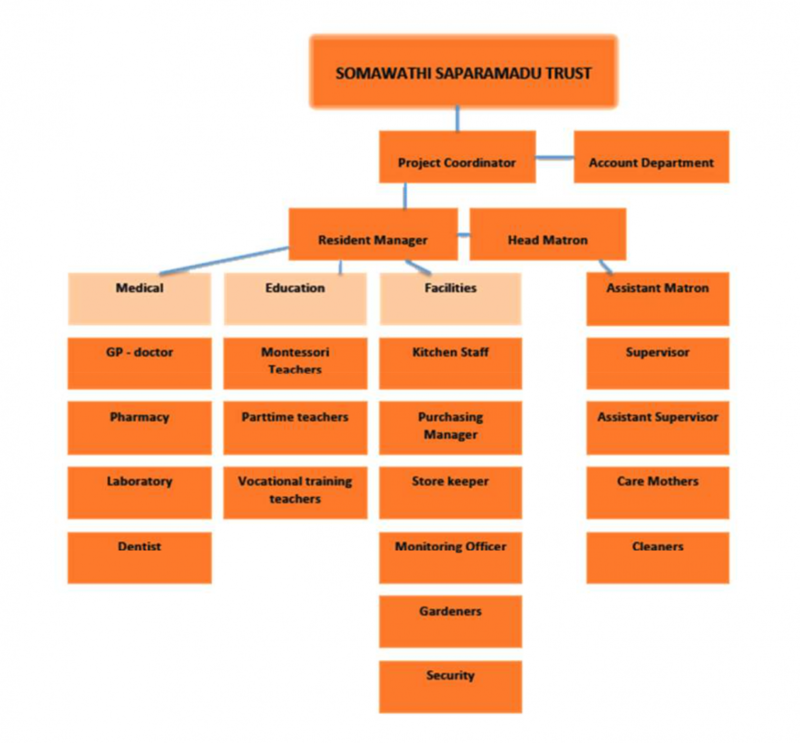 In Sri Lanka the project is lead by the Somawathi Trust, consisting of nine Trust members (six from Sri Lanka and three from the Netherlands) who in fact don’t get paid for their activities. I.e. the land of 45.000 square meters and the buildings are held in a Trust. The Trust pays for the operational costs. Building is effected in accordance with preliminary agreed budgets. Monthly, the Foundation transfers money to the Trust to cover the costs of building and maintenance. Having and keeping a professional staff is of utmost importance to be able to realise our mission. Therefore improvement of the quality of skills of our staff employees is an ungoing process in order to realise more efficient output and growing personal involvement. Training programmes are offered on a regular basis to the staff and the quality of employees is evaluated. Increasingly applying personal qualities of the staffmembers is attempted. The Somowathi Home acquired an A-status level from the Sri Lankan National Child Protection Authority which we want to keep in the next years. Therefore we are very focused on quality improvement, also for our local staff and employees.